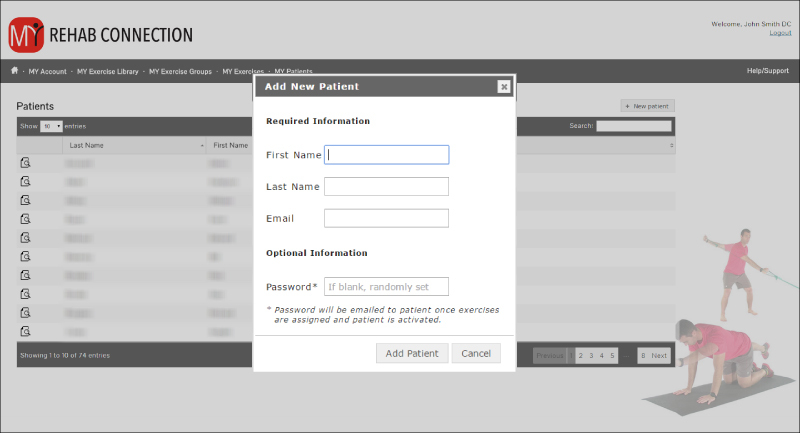 To add a patient to your account click on MY Patients in the menu bar. Then click “+ New Patient” at the upper right of the screen. An Add New Patient Window will appear. Enter the patient’s name and email address in the spaces provided. You will also have the option of adding a password for the patient. The patient will use this password along with their email to log into their My Rehab Connection app on their phone or tablet. If this password field is left blank a random password will be automatically generated. Once you activate the patient (see below) your patient will be send an automated email with their password/login credentials.